JM Sorge (JMS) – New Jersey’s preeminent environmental consulting services firm – approached Ridge Marketing to help them capitalize on new opportunities created within their industry by recent regulatory changes within the state. 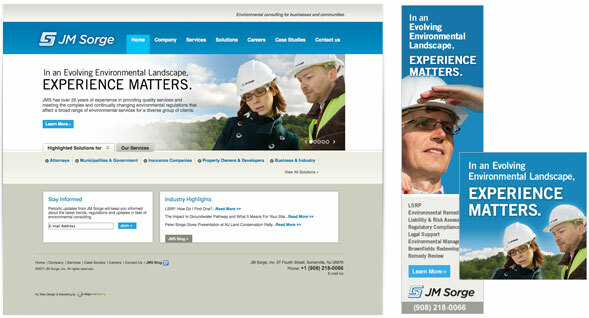 Ridge Marketing put together a plan that included a redesigned and expanded website as its centerpiece. In mid-June, Ridge Marketing launched the new website, which includes new case studies and testimonials, a JMS blog, offerings catered for specific client types and opportunities for employment. Click the thumbnail to visit the new JM Sorge website. After launch day, Ridge Marketing commenced a well-rounded Internet marketing campaign designed to drive additional traffic and generate leads. The first step was an email announcing the new website, which resulted in a nearly 40% open rate. This will be followed up by a banner advertising campaign and email newsletters to keep JMS top of mind with existing customers. A Linked In campaign and press releases will be utilized to attract additional prospects and build links back to the new website while creating greater brand awareness. If you would like to explore the opportunities that a web redesign and Internet marketing campaign might present for your company, please contact us at (908) 340-4480 or Email Us and we will set up a no-obligation consultation.